Gonna Catcha has been updated to v.0.7.3. This update added a new maze to the game, allowing me to bump up the round cap to 12. This also had the side effect of unlocking an enemy type that wasn’t in the previous versions (because it didn’t appear until Round 9). 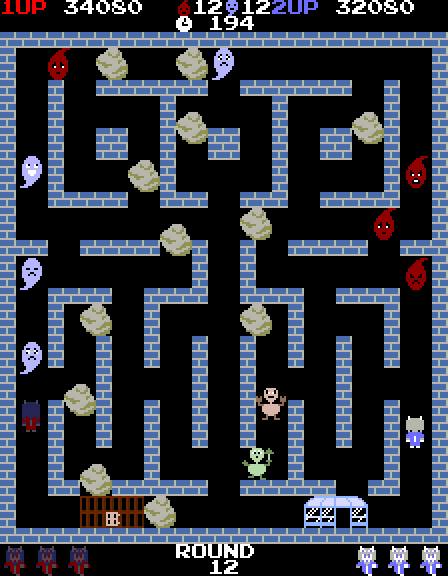 NPCs now also gradually speed up after each bonus round after you’ve played through each maze once. Oh, and there are some miscellaneous tweaks and fixed here and there, yadda yadda yadda. At Games with Friends #45 on November 18. At the Bit Bazaar Winter Market Arcade on December 6. Since I enjoyed looking at and playing all the games that were showcased at the last Bit Bazaar in May, I thought why not participate this time? The Bit Bazaar offered two options: submitting a game as part of the Arcade or getting a table, which requires you to sell something physical as well (e.g., merchandise, Steam keys or preorders printed on something). Since this is my first time showcasing at the Bit Bazaar and I have no ideas for what to sell, I decided to play it safe and go for the Arcade submission. Perhaps I’ll get a table next time. I’ll get you next time , Gadget… next time.